The 33.7 metre motor yacht Spada, listed for sale by Toby Maclaurin and Tom Walden at Ocean Independence, has had a €500,000 price reduction. Built by Dutch yard Hakvoort to Lloyds class and MCA compliant, she has a timeless canoe stern design and was launched in 1998 as a quintessential gentleman's motor yacht. Accommodation is for eight to 10 guests in four staterooms. The master suite is on the main deck and has a private study while the VIP stateroom below deck is full beam. Also below deck are two mirror-image twin cabins and all staterooms have flat screen televisions, iPod docking stations and en suite bathroom facilities. The main saloon of this yacht for sale is configured to serve as a comfortable drawing room and formal cocktail lounge. A bar with three bar stools is to starboard and beyond it are two large sofas in an L-shape formation, a coffee table, a games table and chairs. In the skylounge, large windows allow in plenty of natural light. There is a bar with two stools, a circular dining table and a coffee table with two chairs. The emerald green glass atrium skylight at the forward end adds further light. Twin 482hp Caterpillar engines give Spada a tremendous range of 8,000 nautical miles and she has been carefully maintained and upgraded by her current long-term owner. 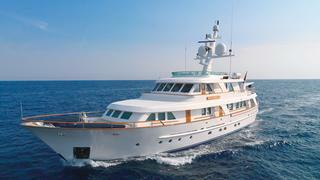 Lying in Imperia, Italy, yacht for sale Spada is down to €5,450,000 with VAT paid.